You guys, I had no idea how totally cool I was. Let me walk that back a minute. I had no idea how totally cool I was if say, being cool was measured by how many middle-aged celebrities you dine with in one night. Anyone have a metric on that? No? Well, let me just tell you that the hubs and I went out to dinner last weekend and made two fascinating discoveries: When we go out at normal dinner time to one of our favorite neighborhood’ish joints, CELEBRITIES ARE THERE; and the manager of said MIDDLE AGE CELEBRITY HANG OUT has celiac. If that’s not a win, I can’t help you. 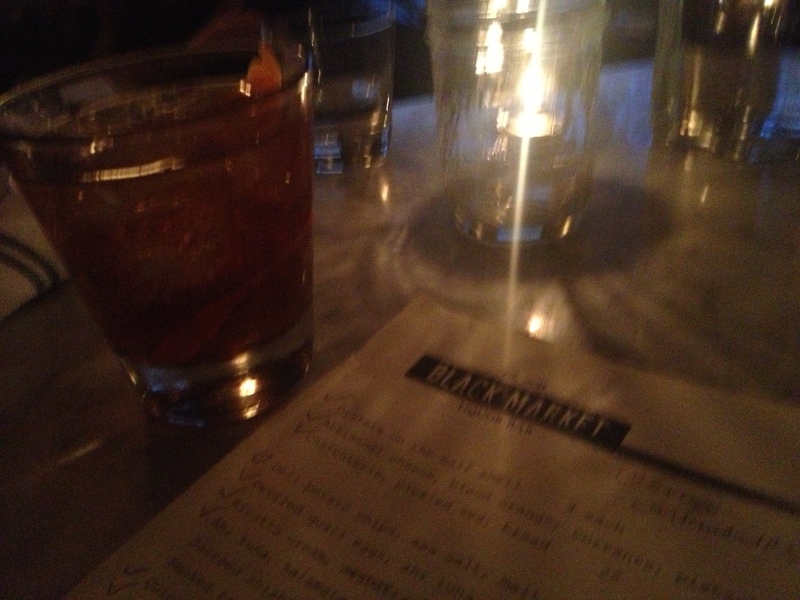 So we rolled up to Black Market Liquor Bar in our Altima, valet’d, took a seat at the tall tables (which I totally hate, and was a bit resentful until I realized we didn’t have a reservation and Ducky was occupying the normal table next to me. Love Ducky. Would have been the weird girl to hook up with Ducky at the prom. #duh) and went on to throw back the whiskey drinks. Which are inventive, and crazy good, as well as being gluten-free. Although one whiskey drink has a beer factor (which is clearly marked on the menu) so skip that action. Not only fully marked, but warning signs on dishes that, while gluten-free, had the possibility of cross-contamination. Solid. 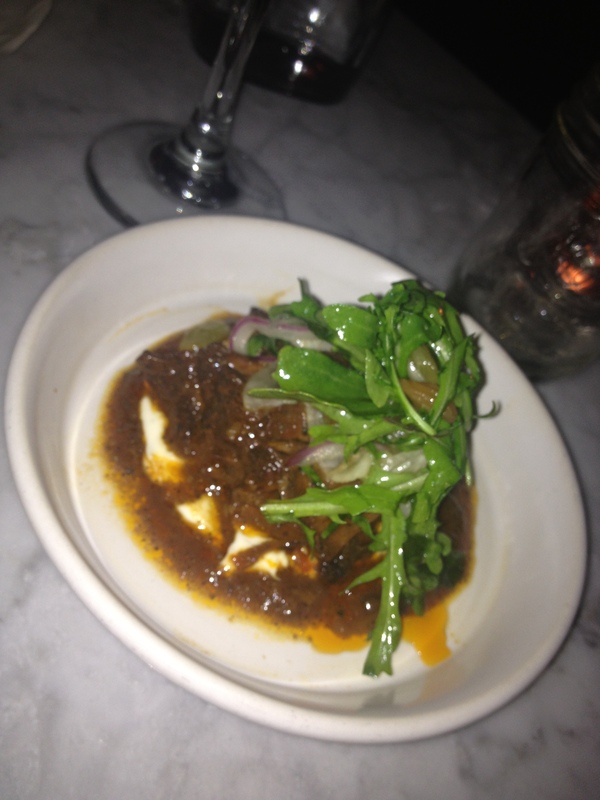 My pictures may be dark and blurry, because clearly it is not only a Hollywood hang out, but a Hollywood hang out for men in their 50s—so you know, flattering lighting—but that amazing dish you see above is my Kurobuta pork cheek, creamed polenta mushrooms, and pickled shallots. I was also able to enjoy some of that ahi tuna I mentioned earlier, a lovely kale salad, and a BBQ short rib situation. Yes, droooooool. It’s always fab if someone employed by the restaurant you’re chowing down in also has the celiac. Not that I’m not suggesting that every restaurant hire a celiac (yes I am), but I felt so incredibly safe while still dining all “hot restaurant in LA.” That’s rare, and it was freaking awesome. I’m banking on Mr. Belevdere showing up the next time I hit Black Market Liquor Bar. Unless he’s dead. Is Mr. Belvedere dead? Tags: gluten free los angeles, gluten-free dinner, gluten-free restaurants. Bookmark the permalink. Previous post ← Gluten-Free Rainbow Cake in the House! Mr. Belvedere is dead, but that doesn’t necessarily mean you won’t glimpse him at a Hollywood hot spot. Awww, Belvedere. This one’s for my very uptight homie. I have not, but I’m gonna check it. Thanks!